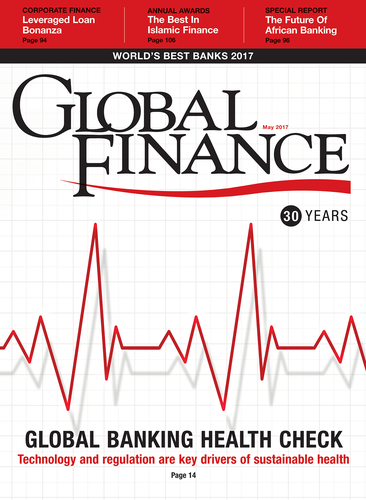 Global Finance: What’s the economic outlook for Latin America—Brazil in particular—in 2017? Antonio Cortina: Since last summer, the economy in the region has been gradually improving. Growth will reach 1.5% in 2017 and 3% in 2018. The bulk of the improvement will be in Brazil and Argentina. Both are laying foundations for sustainable growth and leaving recessions behind, including a particularly intense one in Brazil. Brazil will grow by 0.7% in 2017 after suffering recession in 2015 and 2016 (-3.8% and -3.5%). The government of Michel Temer has the political will and ability—support of more than 60% both in the Congress and the Senate in recent relevant votes—to lay the groundwork for a gradual but sustainable, well-founded expansion that will gain strength in 2018. GF: Have you seen fallout from the Trump presidency? What are the current political risks? Cortina: The region has made significant progress in macroeconomic adjustments, reducing inflation, moderating the need for external financing, setting exchange rates at balance or undervalued and implementing consistent policies. In addition, global growth in 2017 will be higher than in 2016. The area is much stronger to confront external shocks. Mexico is obviously—among the big countries of the region—the most sensitive to US policies given the two countries’ close trade, investment and migration relations. It seems clear that NAFTA will be renegotiated and updated but this is not necessarily bad news. We shouldn’t forget either that the competitiveness of US companies benefits from the integration of value chains with Mexico. The Andean countries are more open to international trade and capital flows and have performed better than closer economies of the region. The new governments of countries like Argentina and Brazil show more political will to deepen international integration. Given the challenges both are facing (very positively I have to say) it will not be easy to see major steps in that field immediately. However, I would expect gradual but important movements in that direction in the short to medium term. Regional blocs are gaining importance worldwide and Latin America cannot ignore these trends. The potential of trade and investment within Latin American has barely been tapped. The Inter-American Development Bank says regional integration offers a $5 trillion-plus market opportunity to boost scale, productivity and competitiveness. GF: Do you see your future results impacted by the likely decline of interest rates in Brazil? Cortina: The decline in interest rates in Brazil, which has just started, is the result of rising confidence in the country, resulting in turn from macroeconomic and financial stabilization, institutional strengthening and political stability. The fall in risk premiums and the strength of the exchange rate point in the same direction. In addition, net interest income sensitivity to declines in interest rates is positive. I can only see positive effects of an environment of more growth and stability.